Until the 1970s, all recorded history showed that bond yields were tied to the general price level, not the rate of price inflation as commonly believed. However, since then, the statistics say this is no longer the case, and bond yields are increasingly influenced by the rate of price inflation. This article explains why this has happened, and why it is important today. This paper is a follow-up on my white paper of October 2015. In that paper I explained why, based on over two-hundred years of statistics, long-term interest rates correlated with the general price level, and not with the rate of inflation. I now take the analysis further, explaining why the paradox appears to no longer apply. The two charts which illustrate the pre-seventies position are Chart 1 and Chart 2 reproduced below. The charts take the yield on the UK Government’s undated Consolidated Loan Stock (Consols) as proxy for the long-term interest rate, and the price index and its rate of change (the rate of price inflation) as recorded in the UK. The reasons for using UK statistics are that Consols and the loan stocks that were originally consolidated into it are the longest running price series on any form of term debt, and during these years Britain emerged to be the world’s leading commercial nation. Furthermore, for the bulk of the period covered by Gibson’s paradox, London was the world’s financial centre, and sterling the reserve basis for the majority of non-independent foreign currencies. The evidence from the charts is clear. Gibson’s paradox showed that the general price level correlated with long-term interest rates, which equate to the borrowing costs faced by entrepreneurial businessmen. It did not correlate with the rate of change in the general price level, otherwise known today as the rate of price inflation. It contradicts the monetary theories prevalent over the period from David Ricardo onwards. In other words, there is no empirical evidence that using interest rates as the means of regulating demand for debt, and therefore economic activity, actually works. And that should worry us. The paradox was first identified by Thomas Tooke in 1844 but named by Keynes after Alfred Gibson, who wrote an article about it for Banker’s Magazine in 1923. Keynes called it a paradox because he could find no explanation for it, and besides a number of futile attempts over the years to explain it, it remained a paradox until I was able to solve the riddle in 2015. The solution was disarmingly simple. A businessman planning to manufacture a product would have to work out his production costs on known factors. His assessment of the product’s future market value was always based on known prices for similar goods. He was then in a position to calculate what interest rate he was prepared to pay over the time taken to deliver his output to the market, if he needed to borrow to manufacture the product. It was through this calculation process that the cost of borrowing was tied to wholesale values reflected by a price index. The widespread assumption in economic textbooks has always been that savers alone set the interest rate when allocating spending between current and deferred consumption. I found only one exception to the view that savers set the rate, and that was almost an aside in Ludwig von Mises’s Theory of Money and Credit. He stated that the demand for capital takes the form of a demand for money. Capital goods or production goods derive their value from the value of their prospective products, but as a rule remain somewhat below it. The margin by which the value of capital goods falls short of that of their expected products constitutes interest; its origin lies in the natural difference between present goods and future goods. This being the case, clearly the rate of interest is set by what the borrower will pay to secure profitable production of future goods, not what a usurious rentier, as Keynes and others had it, will demand. The businessman sets the price of borrowing by having the option not to borrow, or to change his plans. In his calculations, he will attempt to quantify his fixed and marginal costs of production, and the added production additional capital will provide. He must estimate the wholesale value of his extra production, to assess his profits, gross of interest. He must allow for the time taken from gathering together the elements of monetary and non-monetary capital to the product being sold, by assessing the time-preference involved. He is then able to judge what interest he is prepared to pay to secure the capital required for a viable proposition. Clearly, the businessman sets interest rates by bidding them up to the point where savings match his plan, so long as borrowing to fund his production promises to yield an acceptable profit. This tells us something we should have known all along: consumers would rather spend than save and, all else being equal, have to be tempted to save. This is the central truth, which all those who tried to explain Gibson’s perplexing paradox, including Tooke, Arthur Gibson, Irving Fisher, Knut Wicksell, and JM Keynes himself, failed to grasp. Larry Summers even put his name to a paper on the subject which was equally unsatisfactory. One must add that this still held true if consumers increased their propensity to save, thereby driving the level of interest rates lower, and by switching from current to deferred consumption, driving the general price level lower as well. As Hayek showed, lower prices and lower interest rates made it profitable for businesses to invest in more roundabout means of production to match the lower prices that result from a change in the balance between current and deferred consumption. But businesses were still price-makers in the context of lower rates. The reason the great and the good got it so wrong must be in their psyche. It is fundamental to Christianity, and the other monotheistic religions as well, to regard interest as usury. A usurious person is traditionally seen to be an evil idler, a Shylock, someone who extracts money from others simply because they have money to lend, while the hard-working producer does all the work. A saver being paid interest is cast as a leech on society. This prejudice is certainly visible in Keynes’s writings. He called savers rentiers, a term with a slight pungency to it, which conjures up an image of a collector of rents on behalf of the landowner. He even called for the saver’s euthanasia in his General Theory. No wonder the economic establishment missed the point, that the producer wants the saver’s money, which the average saver is generally reluctant to provide. Much follows from this insight. The whole Christian-socialist ethos depends on Keynes’s rentier being morally inferior to the borrower. There is a statist preference for the plight of the debtor over the rights of the creditor, not just because the state is a debtor itself. If, as we can conclude from explaining Gibson’s paradox, the debtor is not an innocent party legged-over by greedy rentiers and therefore not entitled to claim a moral high-ground, we must fundamentally change our views on interest. Economists in the Austrian tradition understand differently from this mainstream view. Admittedly, they rarely addressed which party is the price-maker in this matter. Furthermore, Murray Rothbard’s unfinished history of economics is one of only a small number of important works on the subject that have the philosophical and religious antipathy towards interest as a central theme. Indeed, an understanding, free from moralising, of the relationship between producers and consumers is a sine qua non for all economic analysis. But what should worry us all is that the basis of central bank interest rate policy is aligned with the moralists in defiance of the empirical evidence in Gibson’s paradox. This is now history, as we shall shortly see, not because Gibson’s paradox no longer applies, but because it is buried by other factors. We will therefore continue our analysis in the past tense. Having established why bond yields correlated with the general price level, we must now show why they did not correlate with the rate of price inflation. Obviously, the overall quantity of money borrowed for productive purposes can be reduced by higher interest rates if they are raised by a central bank beyond a certain point. And indeed, if interest rates are raised beyond that certain point, few manufacturing opportunities will be profitable, and fewer still will be embarked upon. Apart from this special case which can only occur at the termination of a credit cycle, changes in interest rates reflect changes in the allocation of money between immediate consumption and savings. The overall quantity of money is immaterial in this relationship. Putting aside the inflationary consequences, if you double the quantity of money, so long as you double money spent in the same proportion on consumption and money saved, interest rates theoretically would be unchanged. Therefore, measures of broad money in fiat currencies can expand or contract, irrespective of the interest rates set in the market. 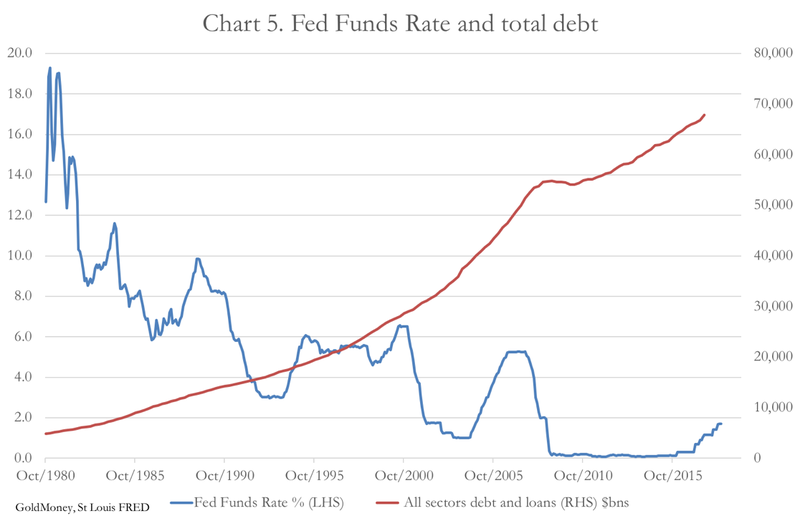 Therefore, we can say that before 1975 changes in interest rates did not lead to changes in the overall quantity of money, demolishing a keystone of monetarist assumptions concerning the use of interest rates to manage demand. The supposed link between a central bank’s management of interest rates and control of economic demand does not actually exist, except when raised to destructive levels. Charts 1 and 2 took us from 1730 to 1975, compared with1730 - 1930 in my original paper on Gibson’s paradox. After that date, the charts show something different. These are Charts 3 and 4 below. It is as if the North and South poles have flipped. Since 1975, the bond yield no longer correlates with the composite price index, while there has developed a closer correlation with the rate of inflation. There have, in fact, been significant changes in the UK economy. These are the same for the US, so the following comments, explaining why this is so, can be applied to it as well. The first point to note is that both the UK and US economies produce proportionately less goods and more services. Goods are generally more capital-intensive than services, and the proportion of total debt applied to financing goods has therefore fallen. The link between production and long-term borrowing rates that existed for two hundred years has weakened for this reason. The abandonment of the Bretton Woods Agreement in 1971 has permitted the dollar, and all other fiat currencies that reference to it, to continually lose purchasing power, instead of fluctuating over time. This is reflected in all indices of the general level of prices continually rising. Obviously, bond yields cannot continually increase in lockstep with the indices without serious consequences. Since 1980, purely financial activities have become a major factor in loan markets. The criteria for loans for financial activities are not bound to the general price level in the way finance for production of goods has been tied. Instead, they are tied to falling interest rates, which inflate the capital values upon which purely financial activities depend. The development of capital markets has altered how companies raise capital, with a greater emphasis on equity financing in recent decades, replacing debt. Consumer borrowing has become a major factor behind loan demand, displacing finance for production with finance for consumption. Consumers are no longer the principal source of funding for industrial production. That role has been taken over by central banks working in tandem with commercial banks through monetary expansion. Therefore, the link whereby business bids up loan rates to attract increase savings no longer applies in today’s monetary context. We know that before the seventies, Gibson’s paradox applied. We also know that post-seventies, it has no longer been apparent, and the reasons why are described in the preceding section. But this leaves a question: does the evolution of economic factors, so that there is now a correlation between interest rates and the general price level, mean that interest rate management by central banks is a justifiable policy? Central banks assume there is enough of a causal link between interest rates and demand for credit to control aggregate demand in the economy. The facts suggest otherwise, illustrated by Chart 5. Spikes in interest rates have had little or no effect on the relentless growth of private sector debt in the US economy since 1980. The only slight wobble in the rate of debt growth was on the Lehman crisis. But it was that, and no more. But things have changed over the last forty years, with debt also being taken up by governments (not included in Chart 5), the finance sector and consumers in increasing amounts. This means that a downturn in one category, even in a credit crisis, merely leads to an upturn in another, particularly so because a downturn in the private sector leads to an increase in government borrowing. Now that we have an understanding of the how and the why Gibson’s paradox no longer applies, we can assess its importance in a new light. A central point in understanding what the paradox tells us is that monetary policy will never achieve its objective, if that objective is to somehow manage aggregate demand by varying interest rates. The function of interest rates is misunderstood. They cannot be used to regulate overall demand for money, they only regulate its use. In this way, monetary policy distorts the economy. Suppressed interest rates encourage businesses to invest in projects that cannot be sustained when interest rates are normalised. Raising rates shifts the businessman’s calculations, forcing him to abandon projects that appeared profitable at lower rates. In theory, raising and lowering interest rates only leads to shifts in productive processes, whose profitability is measured against known factors, including the general level of prices and current borrowing costs. But by setting a credit cycle in motion, central banks end up having to raise rates to economically destructive levels when price inflation accelerates. This is why credit cycles have always ended in crisis. It is as if by using interest rates as a tool of economic management central banks only have an on-off switch, not a rheostat that can vary the current applied. Since 1975, manufacturing has become a diminishing component of credit-driven economies. Debt is now taken up by governments, consumers, and a financial sector that feeds on monetary expansion. Gibson’s paradox is now explained and is no longer a paradox. The relationship between bond yields and the general price level in the context of manufacturing still exists. It has only been buried, because manufacturing has become a minor part of the modern economy. The saver is euthanised, and private sector wealth has become overly-dependent on financial speculation.